Melt butter on low in small saucepan. Warm the milk slightly in the microwave (do not overheat). Stir butter for 2 minutes, being careful not to scorch. When butter is melted, add the flour and stir, then add the milk and whisk until sauce is smooth and thickened up. Remove from heat and add pepper, salt, nutmeg, 1/2 cup of Gruyere and all the Parmesan. Set aside, stirring occasionally. Toast bread on a baking sheet in the preheated oven, about 4 minutes each side. Add mustard to 4 of the slices, top with ham and 1/2 of the remaining Gruyere. Place remaining bread slices on top. Brush with cheese sauce and top with remaining Grueyere. Bake another 5 minutes, then broil for 2-3 minutes, until top gets bubbly and browned. Serve immediately. Parlez- vous Francais? Oui? No? Either way, it’s about that time to get your French on for Bastille Day! So Ooh la, la and all that jazz, let’s celebrate! That’s a definite Oui! Here’s a little history so you know WHY you’re celebrating…Bastille Day is celebrated on July 14 th of each year and marks the historical day when troops stormed the French prison in 1789 during the French Revolution. If you want be down with the locals, it’s known as La Fête Nationale (The National Celebration) in France. Lucky for us Americans, the French flag shares the same colors as ours, so we can look forward to another red, white and blue celebration this summer! Another thing we’re super lucky to have is this cheesy, ham sandwich. Bastille Day here we come! Grilled cheese is undoubtedly an American Classic, and happens to be one of my favorites. So why not add fancier cheese and some ham to make it a filling yet fancier sandwich! Along comes my Croque Monsiuer Sandwich (aka fancy grilled cheese with ham). 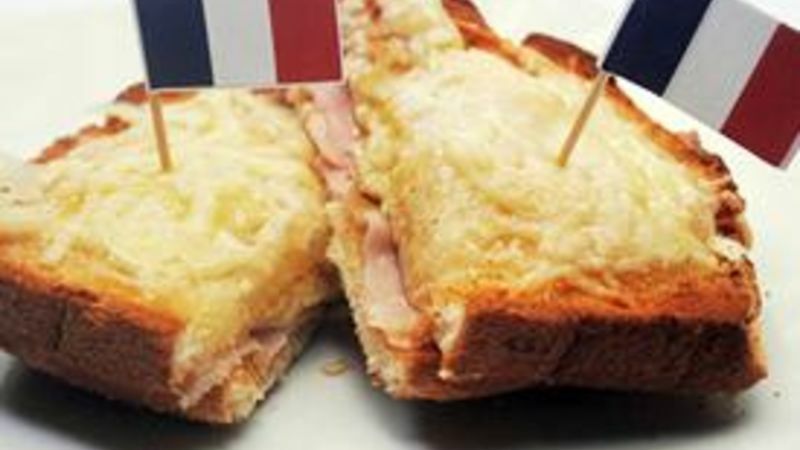 Be a real Francophile by adding your very own French flag sandwich picks, courtesy of this website. You can check out my full recipe below! To rock your own Bastille Day party complete with French foods and red, white and blue décor, check out this Bastille Day party post which is chock full of ooh la la ideas! Au revoir for now!